If you geek out over technology, gadgets, and digital trends but missed this year’s Consumer Electronic Show (CES), you’re in luck! Brad Griffith of Buckeye Interactive attended the show and has once again reported back about everything he saw, heard, and experienced at this year’s exciting event! 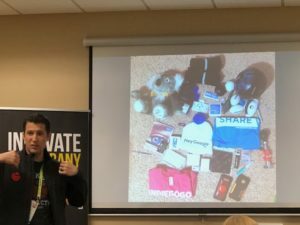 You can actually watch his entire Talk through the Facebook live stream video, or you can access his presentation, and check out some of the photos he shared with us. Brad was Innovate New Albany’s TIGER Talk presenter on January 18. His “3rd Annual Technology Update with Buckeye Interactive” presentation packed two Innovate New Albany conference rooms with entrepreneurs wanting to hear about Brad’s take on CES 2019. Owned and produced by the Consumer Technology Association, CES was held in Las Vegas from January 8-11 and is the largest technology trade show in the world. The show covered nearly three million square feet and hosted more than 4,400 exhibitors, 1,200 start-ups, and 180,000 attendees. Brad shared the CES show map of the three tech venues along the strip — Tech South, Tech West, and Tech East (convention center) — and a grid of exhibitors so TIGER Talk attendees could get a sense of how massive the technology trade show was. Brad said the show was a mix of experiments, distribution deals, forward-thinking early adopters, and all kinds of promotional items. Voice assistants — Tech companies showed off their use of voice assistants in cars, kitchen appliances, oil diffusers, and even toilet seats. Transportation — Exhibitors showcased things like a 102-foot yacht, a Karma Revero ultra-luxury electric car with seven displays, unusually shaped ride-sharing shuttles, and even an RV. Retail — Vendors were eager to show companies how they can sell their products in different ways using a vehicle with a grocery store produce case, a locker for grocery pick-up, portable snack coolers, and smart vending machines. Flexible displays — Brad saw an LG TV rolling up out of a box, massive displays, and flexible cell phones. AR — Show attendees could experiment with an augmented-reality batting cage, learn about an intelligent fish finder, and try their hand at an AR Rubix-style 3×3 Cube. VR — Adventure seekers could wear a virtual reality headset and walk through a ball on rollers, navigate a flying machine, ride a VR motorcycle, or go for a spin in a VR go-cart. Food — CES 2019 featured The Impossible Burger 2.0, a new and improved version of the original plant-based burger that is made of plants but nearly indistinguishable from real meat. Animals — Pet owners could shop for microchip health tracking devices, a cat exercise wheel, and pet monitoring devices. Fun — A digital whiteboard, Google assistant gumball machines, and banana stands were among the fun displays at CES 2019. CES 2020 is scheduled for January 7-10 in Las Vegas. You can learn more about the show, sign up for CES updates, or register for next year’s event on CES’s website. If you’d like to talk tech with Brad about the products he saw, contact Buckeye Interactive at 614-289-7900 or visit their site!